This development is known as a whole as Bay Street Village & Towncenter, and it spreads on the southeast side of Tamiami Trail and East Bay Street. Its design adopts the New Urbanist style that likewise showcases the property’s beachside tropical Florida location. A national leader in home construction, D.R. Horton, is the anointed builder of Bay Street Village homes for sale. 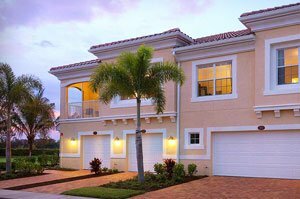 It set in this community its award-winning collection of carriage homes and townhomes in lots platted around the four lagoons in the property. Developed as a gated enclave, Bay Street Village and its adjoining Towncenter provide features and amenities characteristic of a walkable community. The property’s business and commercial hub has about 34,000 square feet of retail space, office space of 58,000 square feet, and 14,000 square feet of fine dining. Within the Village section, residents can enjoy the community’s resort-style community pool, cabana, recreation room, and fitness center. The downtown ambiance of Bay Street Village homes for sale gets a charming counterpoint from their more traditional setting of small lakes and pocket parks including its centerpiece Village Green. D.R. Horton offers four floor plans in this Village, with their floor areas ranging from 1,244 to 1,655 square feet in two- and three-bedroom layouts. Priced in the $200s, Bay Street Village homes had a brisk turnover in 2017 with some 40 units sold. The most popular choice amongst the four designs is the 1,244-square-foot, two-bedroom Heron model, which is the smallest and lowest priced but with many endearing features. This condo stamps quality in its tile roofs, impact-resistant glass windows, paver driveways, screened lanai, and block construction with stucco exterior. The varied life and leisure centers around the Bay Street Village development further bolster the salability of its townhomes and coach homes. A Walmart Supercenter on the Tamiami Trail, for instance, is just adjacent south of this property. There are also first-rate medical facilities, U.S. Post Office, public transportation and six churches within a mile of Bay Street Village & Towncenter. Likewise, Sarasota County’s top-rated Pine View School is less than a mile from Bay Street Village. For outdoor activities, a namesake 19-acre public park just across the street of the village offers several amenities such as nature trails, picnic area, and playground. Country club membership, with privileges for golf, tennis and social activities, is available too at The Oaks Club on the north side of Bay Street. East of this road corridor, biking can be enjoyed along the carless Legacy Trail stretching for more than 10 miles between Sarasota and Venice. For nature tours, the Oscar Scherer Park and historic Spanish Point are also within easy reach from Bay Street Village. Similarly, it will take just a short drive for the community’s residents to access the area’s Gulf Coast beaches which are magnets to prospective buyers on a hunt for Sarasota homes for sale. 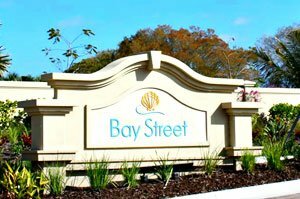 Below are the current real estate listings available at Bay Street Village.